Who doesn't love a YL style Costume Party? Below are a few ideas to help make it "YL'd" and festive. If your club meets in a home, check with your host to see if it's a good neighborhood to pull off this scavenger hunt. It's similar to "Bigger, Better, Best," but teams are searching for items to collect in order to make a costume for one of the team members. Divide up into teams of around 5 folks. Each team picks one person to dress up and one or two streets to hunt on. Don't let teams overlap streets and hit up the same house. Teams go door-to-door, asking at each home for one or two items they can use in creating a costume for their model. At one house they may get an old hat, at another some lipstick, at another a wig, and so on. Set a time limit, and a limit of 2 items per house. When teams report back to club, hold a competition for the best costume. It's a great night to get some photos to post on Instagram throughout the week. Ask a high schooler to shoot the pics and post them up. Here's a video you could have playing on the screen as kids enter the club room. It's old school, but still fun- a Halloween light show to Gangnam Style. Use JibJab to make a Monster video with pics of 5 of your YL kiddos. It costs $ to download the video, but makes a funny transition between different club elements. Instead of your typical club mixer, hold a costume contest. Build a runway. Invite everyone wearing costumes to participate. 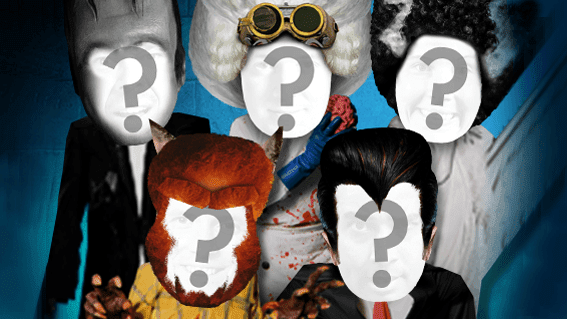 Identify the best costumes before club starts, as those folks cross centerstage, pull them aside. Once you have the top 5 and everyone else is sitting down, vote by audience applause. Award 3 prize catergories: Creative, Insane, & Hilarious. Give a good prize. This works well with a smaller club or larger Campaigners group. Divide into teams of 3 people per pumpkin. Give each a good cutting knife and ask them to be careful. Works best if there can be a leader with each team. They have 3 minutes to cut the pumpkin into 10 pieces. Play music while they cut (see songs below). Then have the teams rotate to a different pumpkin. Have a ton of round wooden toothpicks available. Give each team just 2 minutes to put the jigsaw puzzle pumpkin back together, using the toothpicks to hold the pieces in place. The first team to finish is the winner. Pumpkins must be able to stand alone to be considered. You know those folks who are too cool to dress up for Costume Club, well this game is for them. Call up 4 folks without costumes and tell them you found the perfect costume for them to wear, then make them put on a sleeping bag. After they're wearing sleeping bags have a wrestling match. Pair off 2 at a time, winners face one another for the championship. Just a Costume Club spin on the old sleeping bag wrastlin' game. Make sure you don't do this on a hard floor. Carpet is key. Carve out some real big pumpkins with some funny faces. Cut a hole big enough in the bottom where kids can actually wear them as masks (while holding them). The funny part is the people actually wearing a pumpkin head, once that happens, you can go a few different directions with the game. Either have a running race, which is hard since they can't see well. Call it the "Pumpkin Run.' Or you could cover the pumpkin in cake icing or whipped cream and have kids throw Halloween candy at the people wearing pumpkin heads, seeing who can get the most stuck on their pumpkin. Kids race to cut open a pumpkin, pull out the seeds and spit them towards their partners who are holding a plastic jack-o-lantern. The one with the most seeds after 90 seconds (with loud music playing in the background) is the winner. Check out this link for all the details! 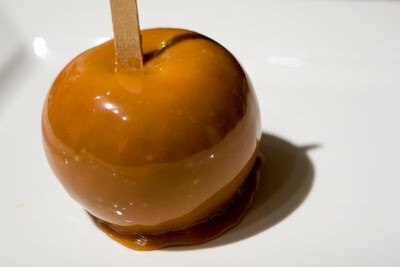 All you need are 3 apples, 1 onion, 4 popsicle sticks and some caramel coating. Cover the onion to look like an apple and have that eating contest. Pretty hilarious. Provide milk and breath mints for the contestant who draws the short straw. For one of the games or the costume contest, award a pumpkin with a crown on it as the award for being the 'Pump-king." Thriller (guitar chords) Download the Thriller lyrics on ppt slides here. Ghost Busters: It's pretty simple to play on guitar, just five chords. Here's a guitar chords link. Download the Ghostbusters lyrics on PowerPoint slides here. Lean On Me: We re-wrote a Halloween version. You can download the lyrics and ppt slides here. If your club meets after Halloween, you can likely get really cheap pumpkins. If you have 30 kids at club, buy 90 pumpkins, so you have around 3/kid. Divide into at least four teams for the Olympic events. It's messy, so have them dress appropriately. Below are 8 different events you could use. Dodge Pumpkin. Everyone sits in a large circle with one person in the middle. Choose a large pumpkin and roll it at the person in the middle, trying to hit the person. Roll it, don't throw it. To make it interesting, increase the number of pumpkins. If a pumpkin splats, replace it. Pumpkin Bowling. Set up empty 2-liter bottles, cans, or bowling pins. Each person rolls a pumpkin once and tallies the total number of pins knocked down. A leader can be constantly resetting the pins. Pumpkin Toss. Similar to an egg toss, two people from a team toss a pumpkin back and forth, stepping farther apart each time, until someone drops it. Pumpkin Put. Put (as in shot-put) a pumpkin through the air and measure how far it goes. Competition may be based on using the largest person from each team, the smallest person, the largest pumpkin, or the smallest pumpkin. Pumpkin Catapult. Using a cinderblock with a board over it and the pumpkin on one end of the board, jump on the other end and measure how far the pumpkin goes. The Great Pumpkin Relay. Set up an obstacle course. Players carry a large pumpkin as they negotiate the course, then hand the pumpkin to the next player. Pumpkin Soccer. Dribble the pumpkin around a cone or other marker and back to the starting point, where the next person takes a turn. Time it. Pumpkin Pick-up. By the end of the Olympics, the grounds are a mess, so have a clean-up contest. Provide plastic trash bags and award megapoints to the team that collects the most pumpkin debris. Have a scale on hand to weigh the bags if possible. Make sure the winning team takes home a prize! *We found some of these great games on YouthSpecialties.com.